Tiki-Toki is web-based software for creating interactive timelines that can be shared on the Internet. Tiki-Toki can be used in any browser and the basic account is free to sign up, which allows you to create a fully-functional timeline. Tiki-Toki provides integration with images and videos (from Youtube and Vimeo). Each timeline you create with Tiki-Toki has its own unique URL that you can share with your friends or colleagues. 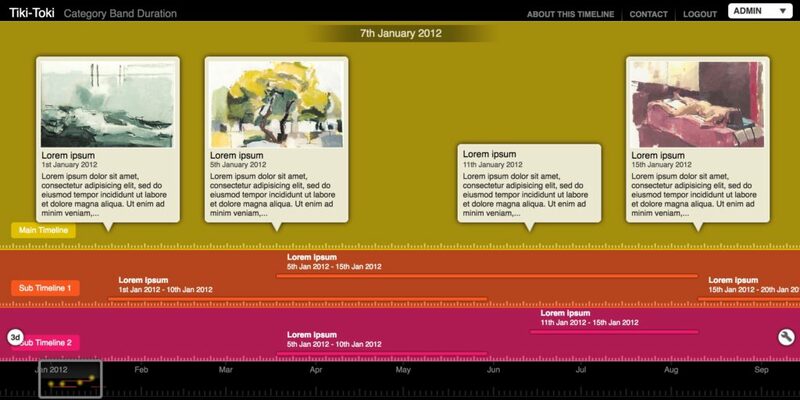 The upgraded version allows you to embed the timeline directly on your website or blog. This tool enables students to create interactive timelines in order to construct and present content knowledge. It also helps students easily understand events and dates in a visualized way as well as allowing them to actively participate in the learning process. Ease of Use: This tool is very easy to use. After signing up for your account, you can simply create a new timeline by filling out basic information, such as title, introduction, start date and end date. Then you can add content, including text, images and videos to your timeline. You are free to check out the Tiki-Toki blogs to view some advance timeline examples and gather some best practices of how to using the timeline products. If you have any questions you can search for help articles or contact the Tiki-Toki team by emails. Privacy: The Tiki-Toki creation group don’t collect any information directly from general visitors to their website. However the users have to share some personal information (e.g., email address, name, location) to login. They state that they may disclose user’s personal information if they are approached by a potential buyer of their business or they are required to do so by law. Accessibility: It allows for multiple means of representation (eg. text, video, audio, images) which helps reach more learners. It also has a few features that help users who can not see very well to avoid clutter of the timelines, such as zoom out functions, adjustable 3D version, and equal spacing modes. There is no evidences indicate that this tool can be used by people with hearing problems or learning disability. 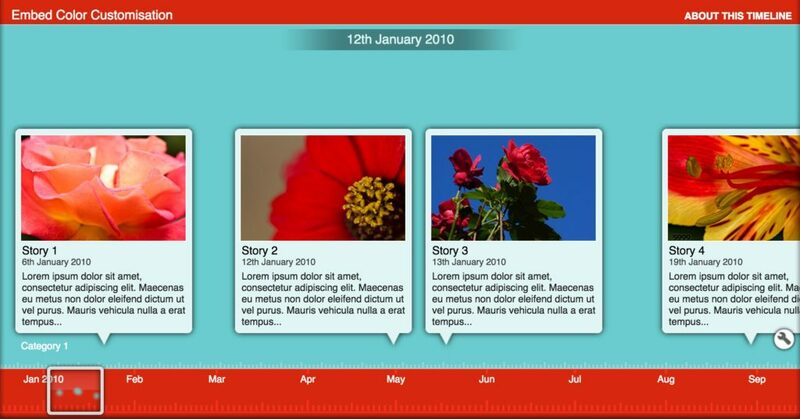 Tiki-Toki is a web-based application for creating interactive timelines that you can integrate images and videos. The basic account is free which allows you to create only one fully-functional timeline, you can embed video and share your timeline with others. With a paid teacher account, you can create up to 25 timelines, and access to new features, for example, 3D version, group editing, and embed timelines in your websites. This tool is very easy to use. After signing up for your account, you can simply create a new timeline by filling out some basic information, such as title, introduction, start date and end date. Then you can go ahead add content, including texts, images and videos to your timeline. You are free to check out the Tiki-Toki blogs to view some advance timeline examples and gather some practices of how to use the timeline products. If you have any questions you can search for help articles or contact the Tiki-Toki team by emails. Tiki-Toki supports students in acquiring content knowledge. For example, teachers can create a timeline that visually displays or highlights the important moments in a period of time. Students can also create a timeline to present the life of famous artists. By doing these, they will have the chance to do the research, and synthesis of information. Above all, Tiki-Toki is a great tool to be used in education field. Substitution: Teachers or students can use Tiki-Toki to create a timeline through the Internet instead of drawing it on a piece of paper or on a white board. Augmentation: Teachers or students can use Tiki-Toki to create more interactive timelines with the functionalities that enable them to integrate image and video into it. Modification: Teachers or event planners can use Tiki-Toki to create a timeline to manage a project or map out a plan in a more easy-to-digest and visual way. Redefinition: Students can collaborate on working on the same timeline project, and share their work with a broad public audience. History: Teachers can use Tiki-Toki create a timeline that visually displays or highlights the important moments in a period of history. In this way of present knowledge will be more motive and avoid cognitive overload. Fine Arts or Music: Teachers or students can use Tiki-Toki to gather a gallery of Fine art works or collect famous music in a chronological order. This will help them remember the order better and make comparison of the works easily. Teachers or students can use Tiki-Toki to create a timeline to present the life of a famous artist or musician. By doing these, they will have the chance to do the research, analyze their works and making generalizations. Literacy/Language: Teachers can use timeline creating activity as a kind of Digital Storytelling method. Students can use Tiki-Toki to create a timeline of a history of their family, and include their photo albums and videos in the timeline. Project Managing: Teachers and students can use Tiki-Toki to manage projects. It helps team members visually track projects and see how tasks relate to each other. In this way, it makes a complex projects easy to manage and organize. Reflection/Assessment: Teachers can have their students create a timeline to reflect their progresses throughout a semester. They can include their digital media products, building a digital profile or illustrate the evolution of their ideas. Teachers can use the timelines their students created as a kind of summative assessment. Heinley, B. J., Dukes, D., Steinkamp, Z., Garrett, B. A., & Romanchuk, R. J. (2008). Creation and management of visual timelines. U.S. Patent Application No. 12/152,672. Murray, F. (2007). Systems and Methods for Creation and Use of a Timeline of Broadcast Streaming Media Programs U.S. Patent Application No. 11/668,290.